The Cask of Amontillado. One of my favorito! works of Poe. :). 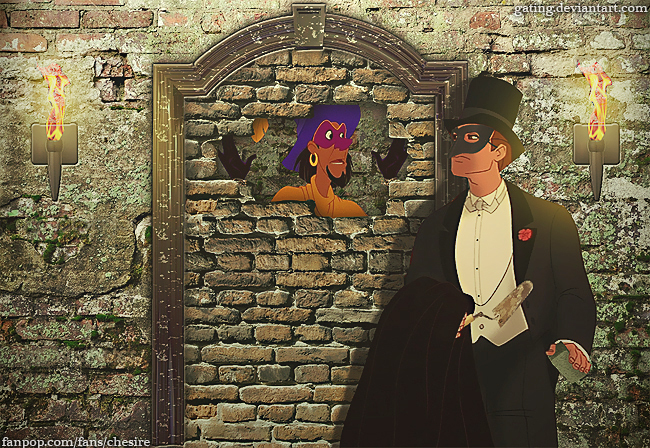 Wallpaper and background images in the disney crossover club tagged: disney crossover non-disney clopin the hunchback of notre dame anastasia dimitri the cask of amontillado edgar allan poe. This disney crossover photo contains traje de negocios and juego de negocio. There might also be calle, escena de la ciudad, entorno urbano, configuración de la escena de calle, ciudad, urbano, and portcullis. Boy this amor is supernatural, can tu feel it? AWESOME! I love this story, and I love Edgar Alaan Poe! Actually, my fifth grade teacher is Poe's great-great-great-great-great niece!